As well, Sensor Gesture Recognizers may implement any number of their own custom signals. Our shake recognizer defines one custom signal, void shake(), as well as the predefined detected signal. 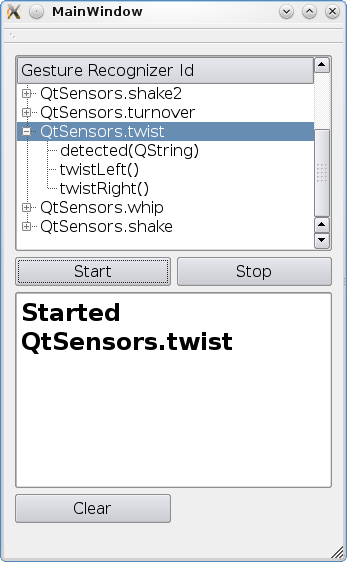 Using the QSensorGesture::gestureIds() function, the manager will return a QStringList of known and valid gesture Ids. We can then use this to create a QSensorGesture object that we can use to connect signals to, and start the detection process. A QSensorGesture object will take a list of one or more recognizer ids in it's constructor. and later stop the detection process. The QSensorGesture object will contain all the signals of the valid requested recognizers found on the system. By using QSensorGesture::gestureSignals(), you can get a QStringList of usable signals.